Over the weekend, I found a dish that I planned on making… wrote out my grocery list, then… stumbled upon another recipe I had saved a while back that intrigued me so much I decided to make that instead (this recipe). 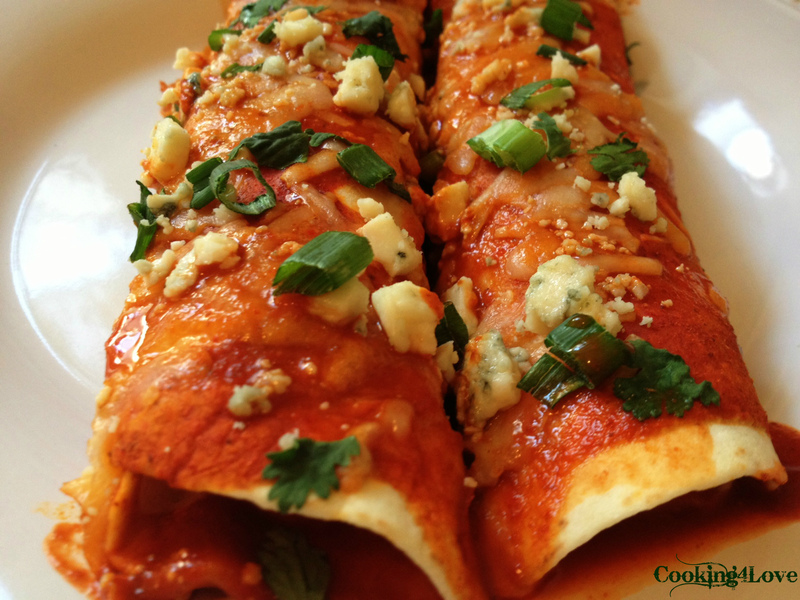 If you like enchiladas and buffalo wing sauce, then you’ll surely love this! It’s a relatively easy recipe once you have the chicken cooked and ready to go. A way to simplify the process is to pick up a roasted chicken from the grocery story and simply shred some of it to use. I chose to poach my chicken since I had some chicken tenders in the fridge, which results in very juicy and tasty meat (instructions below). But feel free to cook the chicken (if you go that route) however it suits you. Pour enchilada sauce in a bowl and begin by whisking in 1/4 cup buffalo wing sauce. Taste and adjust according to your desired level of heat – I added in 1/2 cup total. Set aside. Add shredded chicken to a bowl with 2 chopped green onions and 1/2 cup Mexican cheese. Pour in about a 1/2 cup of enchilada/buffalo sauce mixture and mix thoroughly. Stir until mixture comes together. Pour a drizzle of enchilada/buffalo sauce in the bottom of the baking dish. Take each tortilla and fill it with a few heaping tablespoons of the chicken mixture. Roll each up and set it in the baking dish, seam side down. Pour another 1/2 cup or more of enchilada/buffalo sauce on top of tortillas and add remaining Mexican cheese. After taking out of the oven, immediately add crumbled gorgonzola on top. Garnish with the remaining onions and cilantro, and serve. Store the remaining sauce in the fridge for 1-2 weeks, and use if reheating enchiladas. Start with boneless, skinless chicken breasts or chicken tenders. Place the chicken at the bottom of a wide pan. Don’t overcrowd them. Add enough water so it just barely covers the chicken. Bring the water to a boil, then lower it to a simmer. You should see a few gentle bubbles rise up from time to time, but definitely not a full rolling boil. Simmer for about 10 minutes, then turn off the heat, cover the pot tightly and let the chicken breasts stand in the hot water for another 15 to 20 minutes, depending on how big the chicken breasts/tenders are. After 15 to 20 minutes, take the chicken out and pull/shred/chop them into pieces.. 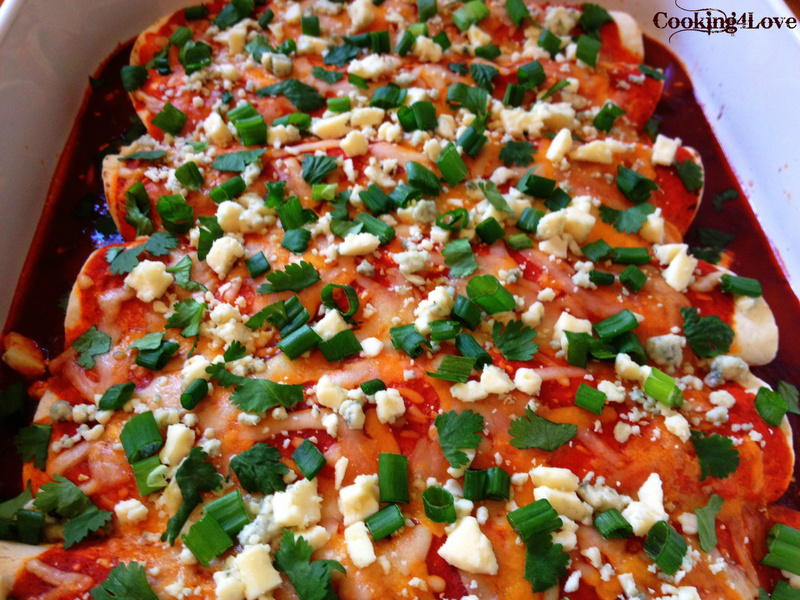 This entry was posted in Chicken, Main Courses / Dinner, Recipes and tagged buffalo sauce, chicken, dinner, enchiladas, gorgonzola, green onions, Mexican four cheese. Bookmark the permalink.